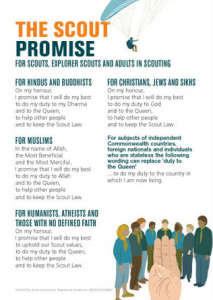 All Scouts commit to the Scout Law and Promise. They will need to have learnt and understood these before being invested. This is the commitment that Scout members across the world make to the values of Scouting. Cub Scouts always do their best, think of others before themselves and do a good turn every day. There are a number of alternatives to the traditional promise available. If you would like to use a promise other than the core promise you can discuss this with your leader.